Our membership brochure is a handy information piece that describes our organization and the work that we do throughout the community. Water Quality Tests in Summer 2012 show Winnebago to be "Eutrophic"
The Lake Winnebago Quality Improvement Association is a non-profit organization striving to improve the water quality of Lake Winnebago, for the betterment of the lake's natural habitat as well as for public recreational use. Our association takes action on lake quality issues through education, communication, and social fund raising meetings for members and guests, and promotes cooperation among governmental units, interested organizations, and the public. Ed Montsma, Pineylawn Acres LLC is the 2018 Mathias – Lesczynski Water Quality Award Recipient. 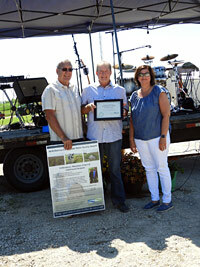 Ed and Kathy Montsma were presented the award at Breakfast on the Farm on Sunday, June 24 at Wiese Dairy in Rosendale. Ed has run a totally no-till operation since 1995. He and his wife, Kathy farm 2400 owned and rented acres in southwest Fond du Lac County, planting corn, soybean and wheat test plots. Participating in the Fond du Lac River Priority Watershed Project’s high residue management program, Ed used his cost-share dollars to retrofit his planter so that he could penetrate the organic layer and achieve proper seed depth and planting rates. 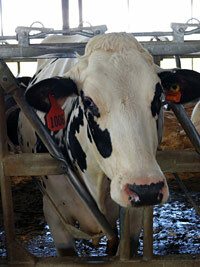 By doing that, he saw great gains in his crop production and saved time as well. The management program encourages farmers to leave crop residue on their fields after planting their crops. Ed is also conservation-minded, putting in grass waterways and contour strips along with his no-till work. Ed enjoys research and works with agricultural and chemical specialists of the University of Wisconsin Extension - Madison to establish test plots. 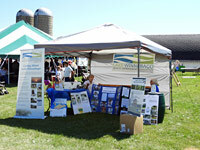 He has hosted many Agronomy Field Days as well as other educational opportunities. It has been a win-win partnership for Ed, the UW Extension, and the local community who can see state-of-the art research taking place right here at home. 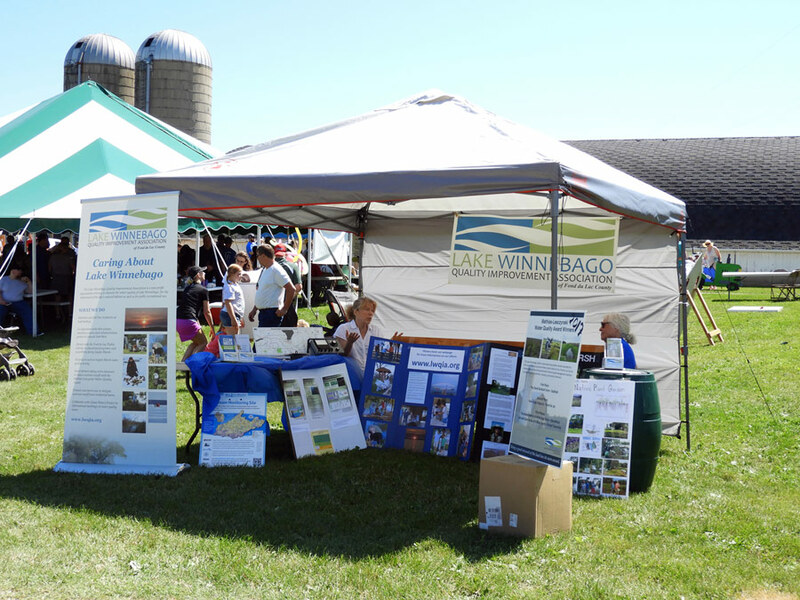 The Lake Winnebago Quality Improvement Association awards the annual Mathias-Lesczynski Water Quality Award to Fond du Lac County farmers that go beyond the government minimum good management practices to prevent runoff of sediment, nutrients, and harmful chemicals. One of the Lake Winnebago Clean Waters Project's efforts is the creation of a native plant demonstration garden in Fond du Lac's Lakeside Park West. For information on the garden and to volunteer to help, visit www.lakesidewestgarden.com. For information on a variety of actions to help stop polluted runoff, visit http://www.lakewinnebagocleanwatersproject.org. 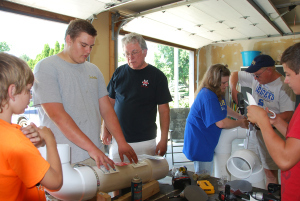 In the fall of 2013, the Lake Winnebago Quality Improvement Association of Fond du Lac County (LWQIA) initiated a Fond du Lac area-wide campaign to reduce harmful runoff into Lake Winnebago. View the Clean Waters Project page for more information. Chris Anderson and Matthew Dudarenke install a receptacle at Lakeside Park West. 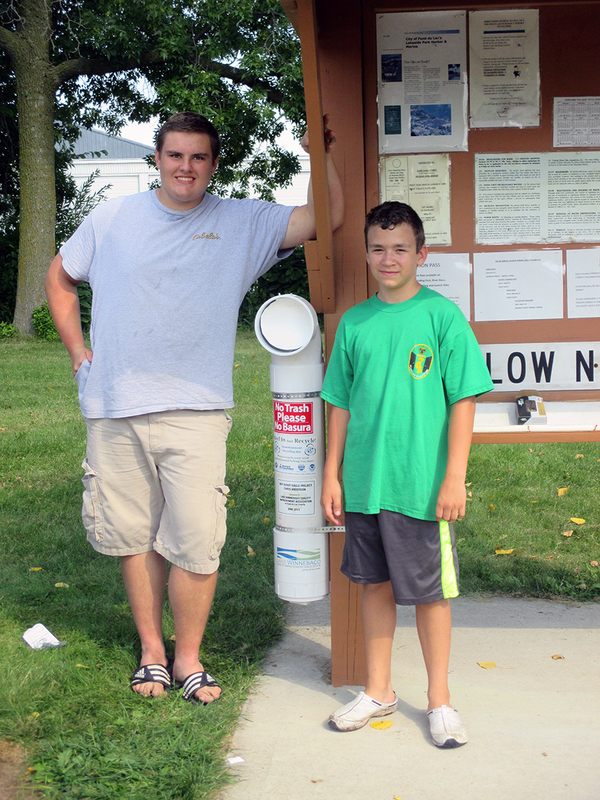 People fishing on Lake Winnebago now have an easy way to dispose of old or unwanted fishing line. Ten fish line receptacles have been placed around the southern end of the lake in an effort to keep the lake clean and safe for wildlife and people using it. 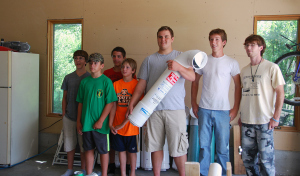 Chris Anderson designed the receptacles from PVC pipe donated by JF Ahern as part of his Eagle Scout project. Fellow scouts from Troop 705 of North Fond du Lac helped with the construction and installation. 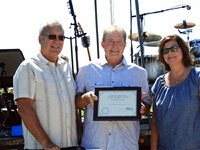 The project was sponsored by the Lake Winnebago Quality Improvement Association. Fishing line, or monofilament, is typically non-degradable and lasts about 600 years. Abandoned fishing line injures or kills fish, birds and other wildlife. Chris discusses the placement of labels with Larry Kent. Chris Anderson is joined by fellow Scouts to work on his Eagle Scout project, including (from left) John Fuchs, Matthew Dudarenke, Mike Fuchs, Jordon Friend, Kurt Weir, and Patrick Weir. The Scouts are from Troop 705 of North Fond du Lac. All Board meetings are at 7 PM on the first Wednesday of each month in the EOC (Emergency Operating Center) in the basement of the Fond du Lac City/County Building. The public is invited to attend. Home | Clean Waters Project | Past Events | Become a Member | About Us Copyright © 2014 LWQIA. All Rights Reserved.